In December, Paris bursts out of its sleepy autumn quiet and lights up literally and figuratively. It's known year-round as the city of light, but in the final month, one could say that it truly lives up to that nickname. Read on for our full guide to how to enjoy this special time in the French capital at its festive best, whether you're traveling as a couple, a family, or even solo. With all its good cheer, Paris in December is nonetheless fairly relaxed, making the month an ideal time to take advantage of the city's many iconic sights and attractions. Take your time exploring museums, sipping cinnamon-infused hot wine, warming your hands and insides with some thick, gooey hot chocolate, or attending a special holiday concert. Have a real retreat from the holiday madness back home and try taking Paris in frame by frame. 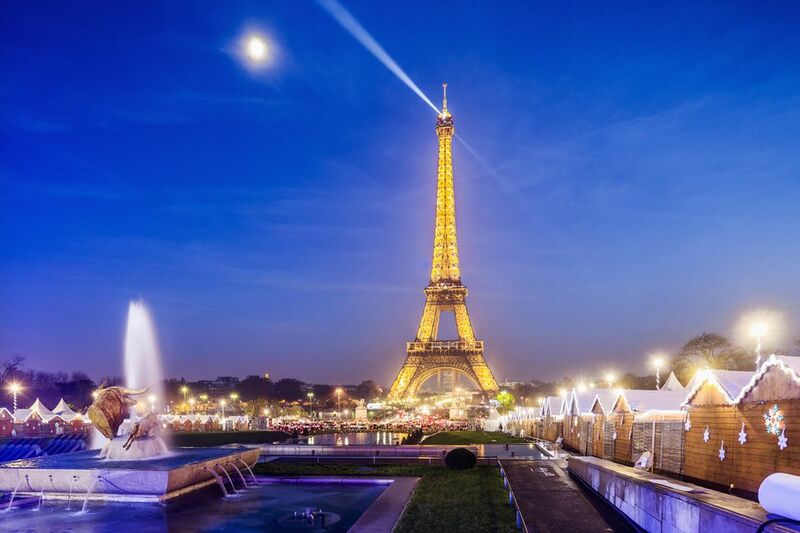 Because of the seasonal rush and a corresponding spike in fares, travel to Paris in December can be costly, so make sure to reserve your plane or train tickets well in advance. December in the French capital is generally cold, and often rainy or icy. Temperatures often approach zero and sometimes descend below freezing. Snow is rare, however, and when it does come, it usually melts on hitting the ground, often turning into a sludgy slush that can be both irritating and dangerous to navigate without good traction on your shoes. Wind chill can make cold seem more biting. Make sure to stock your suitcase with warm cotton or wool sweaters, scarves, coats and thick socks. Bring at least one or two warm turtlenecks, and line your bags with clothes that are easy to layer. A sturdy umbrella is a must, as flimsier ones often won't withstand sudden downpours or gusts of wind. You may also want to pack a windbreaker with a hood that stays in place. Bring at least two pairs of shoes, both waterproof. One pair should provide good traction in case of snow or ice. Heels should be reserved for indoor events as the streets can be slick or icy. If your feet get cold easily, bring a pair of comfortable waterproof boots. A pair of light waterproof gloves and a hat can make walking around more comfortable, but you won't need anything approaching snow or ski gear. Places like New York and Chicago get much colder in the winter. Toting around a small thermos for hot drinks can be a good way to keep motivated in the Parisian winter wonderland. Pack a good camera with a decent low-light setting so you can take some memorable shots of the festive holiday lights and decorations around town. One more word of advice on packing: since this is shopping and winter sales season, you may want to think about packing as lightly as you can to reserve space in your suitcase for holiday delicacies or gifts you plan to bring back home. Even if you don't have any specific plans to shop, the combination of markets peddling enticing holiday treats and the lure of gorgeously decorated shop windows may make you change your mind. Having some extra space for holiday goodies is always wise. There's a wealth of things to do this month, including festive seasonal events that the whole family will love. See holiday lights and decorations: Otherwise-bare trees lining the Champs-Elysées are artfully strung with garlands of shimmering light, and many other places around the city are decorated in the same festive, and decidedly elegant, way. See our full guide to Christmas lights and festive window displays for more information. Go ice-skating: If you have kids in tow, they're in for a real treat: Ice-skating rinks are set up at several locations around the city, and "Santa's villages" complete with toboggans and snow are often on the menu. Stroll through a festive Christmas market: Meanwhile, every year without fail Christmas markets spring up all around the city, with their warm, wood-roofed "chalets," vin chaud (hot wine), enchanting decorations, artisanal gifts and gourmet treats. Chanukah celebrations like menorah lightings add to Paris' holiday-season charm. Shop for unique holiday gifts. Why go for predictable presents when you can find special items that are totally memorable and culturally authentic? See more in our complete guide to hunting for unique gifts in Paris. Book a festive holiday meal. Whether you're looking to book a Christmas-day lunch or special dinner for Hanukkah or pre-Christmas, many restaurants offer special holiday lunch and dinner menus. See more in our full guide to restaurants open during the Christmas season in Paris. Celebrate New Year's Eve. Bring in the new year in Parisian-style by learning local French traditions and finding the perfect spots around town to say your "auld lang synes." See more in our complete guide to celebrating New Year in the capital. Book hotels, flights, restaurants and tickets for local attractions well in advance. This is a popular time of year, and conditions can be quite crowded. Avoid disappointment by making reservations several months ahead of time, where possible. Many places are closed on Christmas eve and Day and on New Year's Day. If you're hankering to visit a particular attraction, site or restaurant on your December getaway, check that they're open if you're interesting in dropping in on bank holidays. Try visiting Christmas markets, department stores and other festive spots during weekday mornings to beat the crowds. Evenings and weekends tend to attract very large crowds. For more information on planning your trip at year-end, see our complete guide to when to visit Paris, season by season.